Mario and Luigi have gotten jobs tearing down a derelict building site, but the mean Foreman Spike and his lackeys have other ideas. Wrecking Crew is an action-puzzle game where the aim is to break all the stone walls on each stage with your hammer. You have to climb ladders and drop down onto platforms to reach them all. Foreman Spike, Gotcha Wrench and Eggplant Man will try and hamper your progress. Use the other objects on the site to stop them. Wrecking Crew also features a Design Mode, where you can create and play your own stages. In Japan (and later releases) you can save these stages to play at a later date. Player I controls Mario. 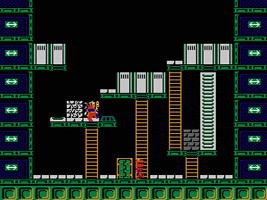 He has to use his hammer to break all of the stone walls on the construction site while avoiding the enemies. In the 2-Player game, Player II controls Luigi. The two players take turns to play. The mean foreman who wants to sabotage Mario and Luigi's efforts. He will appear on some stages and try to knock you off platforms with his hammer. You also have to race him to the coin in the Bonus Game. An angry cross between a dragon and a wrench. It runs around on the construction site, chasing after Mario. It will climb ladders and try to trap you. The purple variety is faster than the red. Often found in groups, Eggplant Man runs in one direction, dropping off platforms and climbing up any ladders it encounters. It doesn't chase Mario, but they can trap him if he's not careful. If Mario spends too much time standing on a single platform, a fireball will appear at the side and move across the stage, disappearing at the other end. They are tricky to avoid. The standard walls that Mario must break to clear the stage. The basic white walls only take one hit, the white bricks take two and the grey bricks take three hits before they crumble. A metal door. If struck with the hammer, it will open and enemies can run through. While in the background, enemies can't hurt Mario. A supporting metal strut. When hit with the hammer, whatever is on top will drop down to the level below. Also known as the dead-end drum, these steel drums block Mario's path. If you hit a pillar with a drum on top, the Drum will trap enemies (or Mario) under it. Mario can use these to go up and down between the levels of the stage. A breakable ladder that counts towards the stage clear. Make sure not to break a White Ladder before using it to reach any high Walls. An explosive that breaks any walls on the same level when hit with the hammer until it reaches a gap. If Mario doesn't move fast enough, it will also knock him to the bottom of the site. May appear when you hit a certain bomb third in a stage. Awards 800 points. May appear when you hit a certain bomb third in a stage. Awards 1600 points. May appear when you hit a certain bomb third in a stage. Awards 3200 points. May appear when you hit a certain bomb third in a stage. Awards 3200 points and makes Mario extremely strong. He can hit enemies, float over gaps and break walls with ease. If you break certain walls in a specific order, you will reveal the letters to Mario or Luigi's names. Reveal them all to receive a 1-Up.